Let’s hit the trail. This a blend of the finest raw nuts and seeds with a sweet blend of dark chocolate chunks that boost your antioxidants. 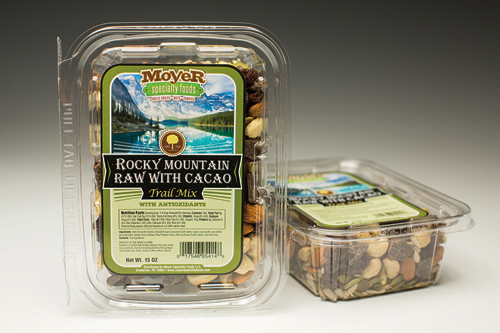 This trail mix is full of protein and fiber to help you in tackle the mountains in your daily life! Ingredients: Dark Chocolate Chunks (chocolate liquor [processed with alkali], sugar, cocoa butter, soy lecithin [an emulsifier], vanilla), Raw Cashews, Raw Pumpkin Seeds, Raw Sunflower Seeds, Raisins, Raw Almonds. Nutrition Facts Serving Size: 1/4 Cup Amount Per Serving: Calories 140, Total Fat 8g (17% DV), Sat. Fat 2g (11% DV), Trans Fat 0mg (0% DV), Cholest. 0mg (0% DV), Sodium 2mg (1% DV), Total Carb. 14g (4% DV), Fiber 2g (5% DV), Sugars 10g, Protein 4g, Vitamin A (0% DV), Vitamin C (0% DV), Calcium (0% DV), Iron (0% DV).Percent Daily Values (DV) are based on a 2,000 calorie diet.